A few years ago, we did a Getting Blind With Crafty tasting of golden ales (remember when they were the rage?). One of the beers on the lineup was Red Hill's Golden Ale. It was their biggest seller and one that had been around longer than most, after all. At the same time, it wasn't a golden ale as understood these days – for the most part, toned down pale ales that still have some sort of light malt and fruity hop character. There's was created in the spirit of the Kolsch style from Cologne, so a rather different beast. 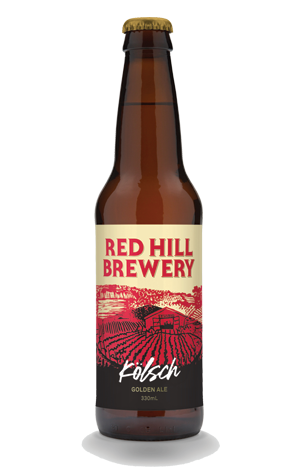 Roll forward to the end of 2018 and the beer has had a revamp – not in terms of what's inside but outside, as it's one of the first Red Hill beers released with the new look branding and is also now called Kolsch (albeit with "Golden Ale" underneath). Thus you can expect soft floral aromas in a very pale beer with a lightly sweet malt character reminiscent of a pilsner and a gentle broad bitterness.